Home PERSONAL Bestie's Baby Shower - Pics! The theme was "Vintage Sweet Shoppe" with a turquoise and purple color scheme. This is this the first baby in our group so of course we had to go all out. 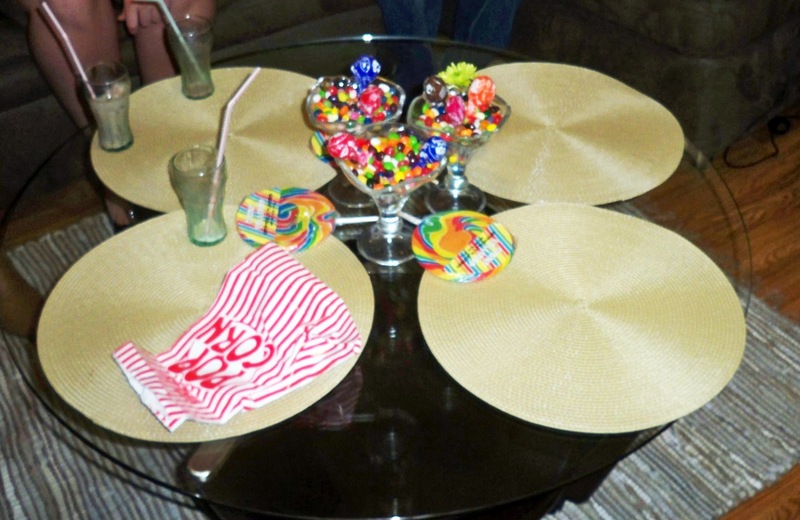 Here's a shot of the cake table...we had ice cream themed cake and cup cakes and apothecary jars filled with candy. When guests arrived, they had to fill out name badges. Each had a different ice cream flavor...that's how we determined teams for games later on. The little flower vases are actually also filled with candy! Outside the house, we made giant sized lollipops using large, round balloons, covering it with gift basket cellophane baggies, and then attaching it to wooden dowels that were stuck in to the ground . Here's a shot of the cake made by one of our mom's in the group. 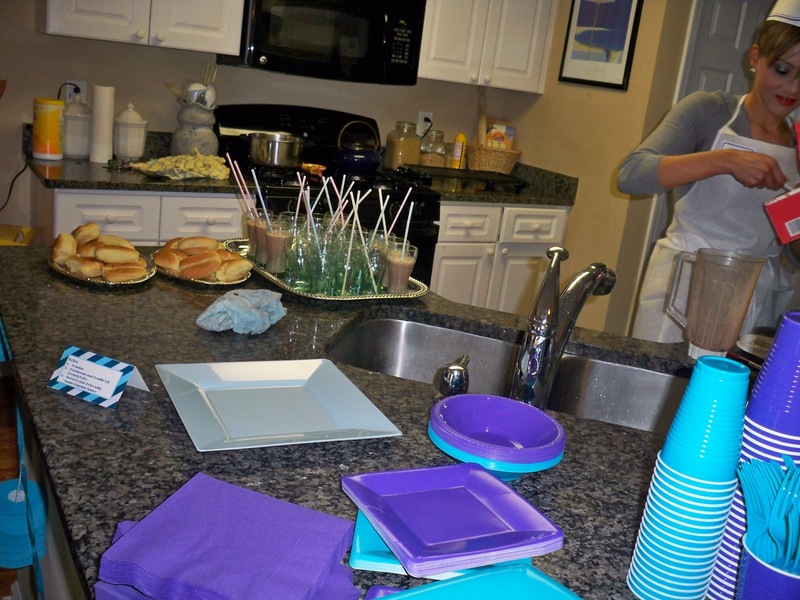 We had the purple and blue pin-stripe match the shower invitations. The theme for food was "Upscale Diner". We found cute vintage coca-cola shot glasses at the dollar store and filled them to make milk shake shooters. Check out one of the planners in the back right corner...we all wore vintage ice cream shoppe hats and aprons to make it seem like we were working the soda shoppe. Shot of some of the attendees. Mommy to be is on the far right. 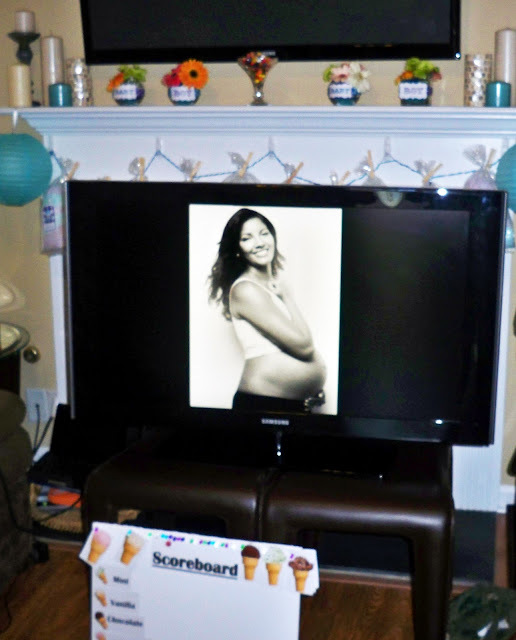 My BF and I did a maternity shoot and blew up the pictures into a poster so that she could hang them in the nursery. We also used the pictures to have a running slide show throughout the shower. We also had Mo-Town Soda Shoppe music playing in the background. Everywhere you went there were vintage Sundae Glasses filled with candy. We even had a vintage popcorn machine! For favors, we gave away Custom Labeled Bags of cotton candy in our color scheme. Here's one of the games we played "The Price is Right Baby Edition". We displayed a powerpoint on the flat screen and teams had to guess the prices of common baby items. The argyle print on the slide again matched the baby shower invitations (it's all about the details!). People really got into it, lol. Here are Mommy and Daddy deliberating on the winner. Another game was to make a custom ice cream flavor for the Baby! The winning team describing their concoction! At the end, we surprised the mommy to be with a video of her mom saying a special message. The Grandma couldn't make it to the shower because she lives in another state and had to take care of her husband who is ill. Nearly everyone cried at this part, lol. Here's a shot of the gift we got the mommy. A monogrammed Ducky Themed Onesie and Bib Set. It went perfectly with the Tiffany's Piggy Bank which was actually a Ceramic Duck. That way the baby can learn smart spending habits early! Here are mommy and daddy making the first contribution. I didn't get a clear picture, but all of the girls and I wore red lips to go with the vintage theme. I used OCC lip tars in a variety of different reds to match everyone's skin tones. It was awesome! Hope I was able to share some tips for those of you planning a baby shower! Till next time, Ciao Bellas! great psot everything was sooo cute!! not an ordianry babay shower at all very cute!! You all did an amazing job... thank you for sharing these great ideas and congrats to the future mommy. Awww.... congrats to your friend on the new arrival! I love the baby shower theme, so cute! Great photos!! That looks like you all had an awesome day! :) congrats to the lucky mom!